Start by getting your dog used to you holding her head and nose. Pet her head, gently hold her muzzle in your hand, and give her lots of treats until she is comfortable with it. Now you can start teaching this trick. Your ﬁrst step is to teach your dog to balance the treat on her nose without moving. Choose a cue such as “wait” or “freeze”—but you won’t use it just yet. Then, while you gently hold her muzzle steady, place a cookie on her nose. She may start to move, but try to keep her still. After a second or two of balancing the cookie, take it off her nose, praise her for being such a good dog, and give her a treat. If she moves before you want her to and knocks the treat off, don’t let her get it. She needs to learn that she gets to eat the treat only when you say she can. Repeat several times. As your dog gets the idea, begin to loosen your hold on her muzzle. If she is being good and staying still, you can even try moving your hand a few inches away. Don’t expect her to stay still for very long, though—remember that you’ve just started teaching this trick. Gradually require her to stay still for longer periods and move your hand farther away from her before taking the treat off and rewarding her. 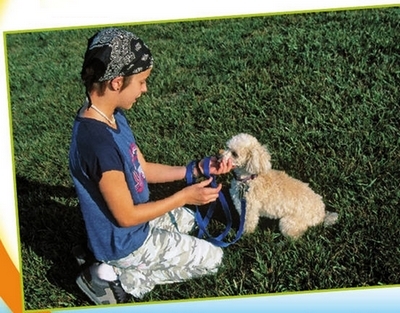 You can add your cue word when your dog is holding still for several seconds without you needing to steady her muzzle. Once your dog will stay still with the cookie on her nose for twenty or thirty seconds with you a few feet away, you can start giving her a release word, such as “okay!” and letting her eat the treat off her nose. It is important not to let her do this until she has learned to balance the treat, so that she will be less likely to cheat. If she moves and drops the treat before you release her, try to get to it before she does. You may need to stay close to your dog until she becomes reliable about waiting until you release her. Some dogs will ﬁgure out how to ﬂip the treat up and catch it, but others just aren’t good catchers. It’s a great trick either way! This trick is a bit more difﬁcult because it requires your dog to hold still with a treat (we’ll call it a cookie) on her nose until you release her.